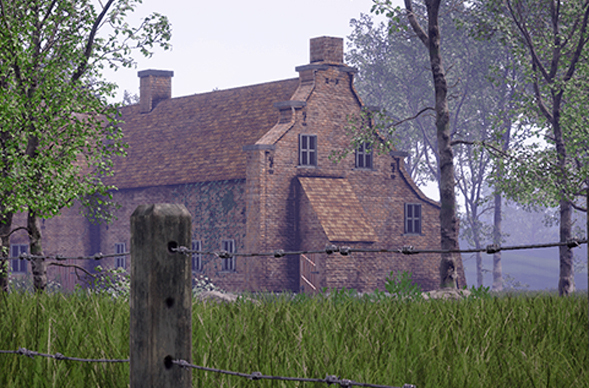 Below, the Brukel farmhouse, girlhood home of De Schutter's grandmother. Bottom right: De Schutter and his grandmother (images from De Schutter). Bob De Schutter’s interactive game, “Brukel,” won runner-up for best digital game award in the game development competition at the International Academic Conference on Meaningful Play Saturday in East Lansing, Michigan. 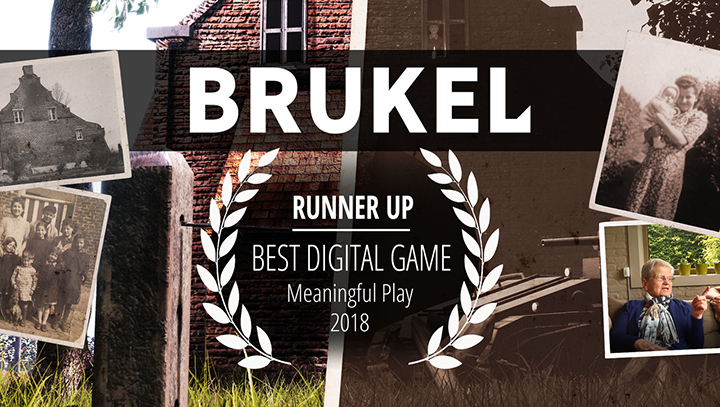 “Brukel,” an interactive game that recreates the narrative of a reminiscing elderly female World War II survivor, is based on the experiences of his Belgian grandmother (born in the Brukel farmhouse). The game intends to sensitize players about the impact of war on the lives of innocent bystanders. De Schutter, the C. Michael Armstrong Assistant Professor of Applied Game Design, received Miami’s Junior Faculty Scholar Award for sustained excellence in business, education and social sciences last spring. His unique role in the College of Education, Health and Society (EHS) is to advance the shared interests of EHS and the Armstrong Institute for Interactive Media Studies (AIMS) with respect to games and learning. “One of the reasons Miami’s game program is ranked among the best is that we study and build games beyond 'Candy Crush' and shooting games,” said Glenn Platt, the C. Michael Armstrong Chair of Interactive Media and director of AIMS. “Games like Bob’s demonstrate the best that games can be: They make you think, learn and engage in ways that other media cannot,” said Platt, a professor of marketing and interactive media. “This game is the culmination of years of work by Bob and with help from some of his students. De Schutter said he has not yet finished the game but hopes to release it to the general public next summer. “Even though the game was mostly a one-man endeavor, a number of AIMS students made significant contributions (mostly 3D models and some music) to the development,” De Schutter said. It was the first time he entered the game into a competition. Meaningful Play is an international conference with participants from more than 12 countries. There were 80 submissions in the game design competition. Thirty-five were accepted and “Brukel” finished in the top three. There was another runner-up. First place in the best game award went to “ABC Mouse Mastering Math” that was made by a professional company and the other runner-up was “Forgotten Anne,” also made by a professional studio, De Schutter said.